I don’t really know about you, but I’m feeling a little giddy right now. There’s only a few days left before I go back to school. I don’t really know if you know my story but since I’m in the mood to write a long post today, I’ll gladly narrate it to you again. For the last two years, I’ve been studying in one of the Top 4 Universities in our Country. I would be proud to say as well that I have even passed our so-called cut-off policy wherein you get literally thrown away if you’re not good enough to overcome most of your batchmates and get in to that half of the 1st year batch list to get admitted on the 2nd year. And if you didn’t pass? You’d have to go search for your own school for the next year. They would actually pinpoint to what lower school you’ll get into for the next year. Now, add up the fact that I actually survived the next year that came after despite going through my first real hard-core heartbreak. And that I’m still just but another teenager finding her way in this big world. And that in those two years, I also had to go through a huge amount of different diseases that some where even classified as life-threatening. And that I also had to go through typical professor criticisms as not being talented enough. It was the hardest years of my life, I must say. But time came when I suddenly knew that I was on the wrong track. I still go through people who would ask me why I would leave such a prestigious school and course (my former school is actually well-known in producing great architects in our country). And I know I would actually encounter more people like them for the rest of my life. I knew this was a move that many would forever question. But no one knows how badly I had to go through fitting myself in a place that I now know deep inside that I never did belong. True. I have made wonderful friendships and encounters in my life in those two years, but me being an architect? Ha! I would actually curl up into a ball scared, every time a friend of mine would tell me that he wants my house to be designed by yours truly. I treasure each and everyone of my friends that I don’t ever want to fail them. But they trust me. As a high school student, they’ve seen me grow from someone who never speaks that much to someone who would perform on stage for dance competitions. They’ve seen me grow from a typical student to a Top 8th Honorable Student. They’ve seen me do my best and even teach others for being that good on it. I’ve bloomed beside them in just a short course of 4 years. That is what I would like to bring back. I’d like to bring back that girl who isn’t afraid to show the world that she could excel in things no one thinks she would. That girl who doesn’t care what others think as long as she fulfills the wishes of her heart. That girl who knows she can’t be able to contribute better to this world without actually doing the best she could do in something she is passionate about rather than doing the best on what she knows she isn’t as much as capable of. That girl who’ll pursue her dreams even though no one believes in her and actually proves them otherwise in the end. It’s time to bring that girl back. 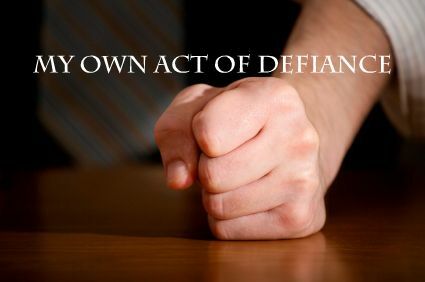 It’s time to make my own small act of defiance. It’s time to go against the flow. Good like Dy! I didn’t know this, I just read this. If I were there I would have given you a hug but I will just tell you this: I truly admire you for your courage to start again. I know it’s hard but it’s also brave. Bravo!! Good luck! And keep me posted through blog and twitter!